Few people have even seen a symphonic score much less followed its complex flow instrument by instrument, bar by bar, page after page, but there is an important storytelling connection between scoring and writing. 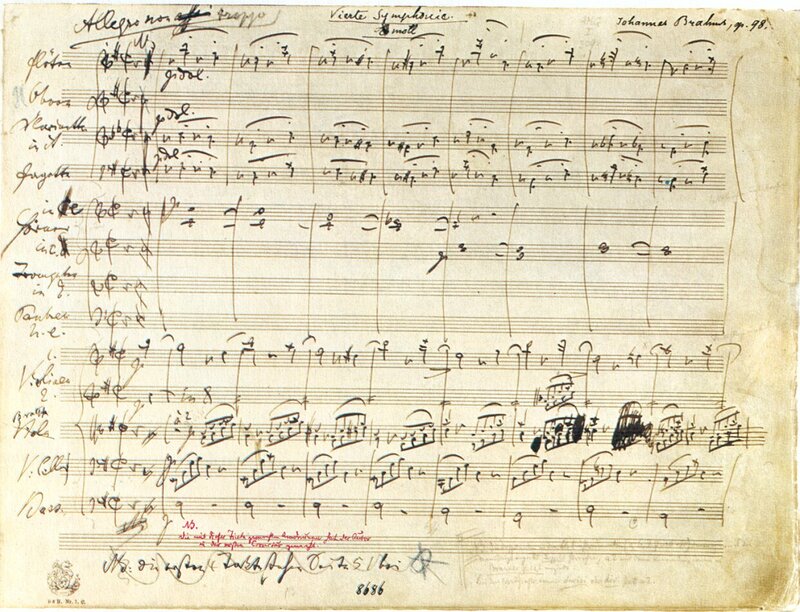 Below is a single score sheet for Brahms 4th Symphony (courtesy mfiles), and a link to the movement. Unless you’re a musician, this won’t mean much. But play the piece in the background and for a moment just contemplate the way the score serves the entire narrative, then scroll down to continue reading. At first glance the score may seem nonsensical until one realizes that each staff represents an instrument – with every note, every silence occurring in simultaneous, synchronized time. Each part is related to every other part in the piece. Sounds lope and flitter and hammer; they compete, call and respond. Some instruments dominate while others barely register, yet each carries a particular weight in the composition. The timing that brings one instrument in while others crescendo or drop away is crucial in sparking our engagement with the piece. Separately it’s meaningless. Together – a masterpiece. This is composition at its purest. So compelling is the whole that we seldom notice the fundamentals of interaction or the timing and arrangement of what we’re hearing, in the same way that we don’t see among the symbols of language strung together into sentences and phrases and paragraphs that Tolstoi and Brahms were doing the very same work. For that matter, so was Led Zeppelin – only in a different way. It’s the richness of the score and the ways in which all the pieces of literary and musical narrative are brought together that create story. The spectrum is wide – from Shakespeare and Mozart to Mother Goose and Happy Birthday. Every writer and every composer falls somewhere within the spectrum. Some create magic from very little. Can anything simpler be more fraught than Joyce’s An Encounter? Can we ever extricate Rodrigo’s Concierto de Aranjuez from the ineffable arc of joy and tragedy and redemption that formed its very heart? Through the blind composer we see. In music, the score allows the listener a chance to witness the intimate workings behind what we experience aurally. The composer’s creative mind is approximated – vaguely so, but approximated nonetheless. Allegro non troppo, the composer commands, and viola and violoncello thrill to life. The eye passes up and down the page, taking in the very building blocks of genius. We may never understand why certain instruments are brought in rather than others, but the brilliance of the choice is indisputable. Why this tempo and not that – and why exactly here but not one beat sooner? How much more we appreciate the music when we can follow a score and marvel that a single mind was capable of pulling combinations of sound and silence from some place of light within, translate what only he or she can conceive into commonly understood symbols, and become for the listener a kind of medium through which we are somehow able, in some cases, to access the truly sacred. The blueprint of any narrative composition – the literary arrangement from the writer’s own hand that expresses the order and combinations and signifiers for timbre and pace and character and the indefinable quantum matter of creativity – does not exist. It remains part of the imaginative mystique lost forever by the time a piece enters public consciousness. Even when drafts become available archivally for later study, they are not at all what the score represents, which is more mapwork than iteration. Access to drafts is access to choice – a change in dialogue, adjustments in character or setting or focus. They cannot let us see at a glance the working map of the finished piece. The writer’s process is no different from that of the composer’s. The writer begins with emptiness and silence. Just as the composer chooses from a standard array of instruments through which the story will unfold – characters in strings, woodwinds, brass – it is the way they are played that give them voice. The same instruments and the same character types become distinctive in the hands of different masters, and from period to period. The writer assigns tempo – narrative pace; here slow, a build-up, a quickening or a pulling back. Through the combination of pace and character choice, how characters play off one another, the way they speak, the setting within which they will be given life, the writer creates timbre or tone. The galloping pace of a thriller, the slow, contemplative tone of literary fiction. Mixing up the relationship between pace and tone can be an act of narrative transgression as much as a writer’s lack of skill or talent, but even if the writer is conscious of the choice, the reader must inevitably agree that the discord is not evidence of inability. In the end, written composition is very much like only having the symphony but no score to better understand how the work comes together. Though there is no formula or template to create a brilliant piece, the elements a writer brings in – when, and how – and the ability to sustain the narrative through each choice are the essentials of magic-making. Until the literary equivalent of a score is invented, use my Fiction Timeline Worksheet 2.0 – sandrachmara to create a narrative map for each project. Finding a great fiction timeline worksheet online is impossible, yet keeping track of a story and organizing the details is probably a minor obsession for many writers. What’s the best way to do it? Tables and storyboards, electronic files, lists, post-its, yellow legal pads, white boards, folders, even using recipe cards and laying them around on the floor? Personally, none of them ever did the job. It was too much text, too many papers or files, or just a mess that made tracking hopeless. Whether it’s straight storytelling or a complex work of non-linear fiction, losing control is not an option. To get a handle on trajectories, research, pertinent dates, characters, plot development and the myriad other factors that go into creative writing projects, I’ve developed an easy-to-use Fiction Timeline Worksheet based in Microsoft Office Excel 2007. It’s graphic rather than text-based, and works for short and long fiction alike. Though the timeline itself is linear, those writing non-linear fiction will find it invaluable. After all, time only moves in one direction even if the narration doesn’t, and it’s adaptable enough to work on both micro and macro levels. It relies on quick points rather than elaborations. This distillation process helps the writer understand a project’s most important elements. It’s visual and it’s flexible, which means that connections can be made through colour-coding, and details can be moved around easily to adjust how the story unfolds. It also supports the dynamic nature of creative work, so as narratives get pulled apart and recreated or shifted around in time, changes can be made instantly. Novels can be laid out on a single timeline, or broken down into modules like chapters or scenes. Use it to map out a new project or reorganize an old manuscript that’s not working out. Alter elements according to the needs of each project. The Fiction Timeline Worksheet is continually under development, so if anyone has any feedback – what works, what doesn’t, what’s missing or unnecessary, please feel free to comment. My only request is that the proprietary header not be removed, and if it’s passed along to others please be sure to refer back to this web site. Follow this blog for updates on a game-changing story development tool that will do what no existing writing system can – turn writing into storytelling so writers can finally understand how to engage readers to give themselves the best chance possible to get read and get published.